Hello there, did you see the sneak peeks of the new Clearly Besotted Stamps release over on Stephanie's blog yesterday? Today and up until the release on the 5th, the DT and GDT are sharing more teasers with you. My card for today uses the new Fresh Flowers set. Oh my word it is beautiful! I have used the Orange Blossoms image (I assumed these would be orange in colour but they are not, they are white!) and stamped it with Versamark, added white embossing powder and heat set it. I have then lightly coloured it with TH Distress markers using my waterbrush. The sentiment is from the A Little Sentimental set, it has been stamped and then cut out using the banner die from the Tag Along Die Set. Thank you so much for visiting me today. Please pop over to Stephanie's blog where she will have amazing samples (I am sure) as well as links to all other DT sharing today. See you tomorrow! Firstly, thank you for pointing out what the flower is (and that it should be white!!!) I took some creative license as mine are bright pink!!!! Your card is just stunning Michelle - I bet it looks even better IRL. Gorgeous card Michelle, as usual! This is stunning Michelle. The image is gorgeous and looks so fabulous with the white embossed outline and delicate colouring. This is so gorgeous Michelle, really soft and pretty! Fab card Michelle. I love how the white embossing and your colouring make the flowers appear raised. Must keep my eyes out for the new release. Tfs. Amazing how with so little colour the image still shines. Gorgeous CAS card! Gorgeous card Michelle!. Love the embossing. Great to join you this month, I am so excited! Such a stunning card; you've showcased this new set beautifully! Elegant and exquisite! Gorgeous card, Michelle! Love the soft coloring and pretty image. It all looks beautiful on the kraft cardbase. Michelle, this is a gorgeous card. 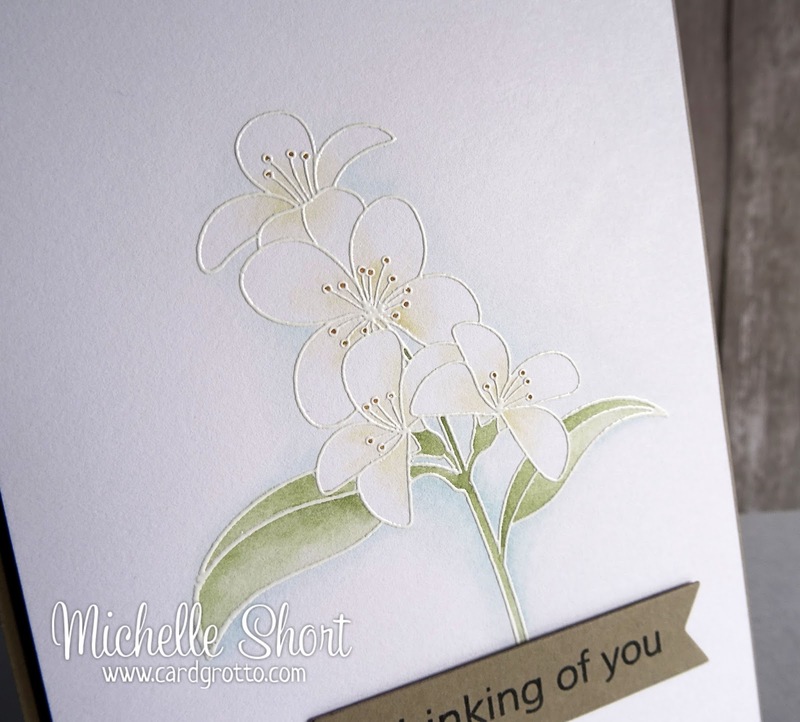 The white embossed flower with the colouring in those soft shades just looks great. Absolutely stunning! WOW! WOW! WOW! Wow, this is absolutely stunning! So elegant. Gorgeous card Michelle, I'm in awe of your colouring skills. This card is so elegant ! Beautiful stamp ! Such a beautiful card. Love it! Oh, Michelle, this is BEAUTIFUL!!! Gorgeous card! Your watercoloring is so delicate and beautiful! Such a pretty card Michelle - love the watercolouring. As usual can't wait til the release tomorrow!! !